Blow it up, print it out and study! 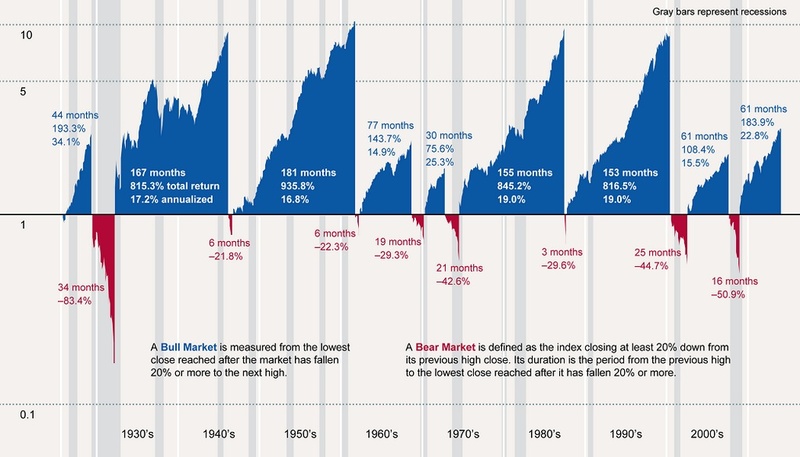 Jerry created the chart to show nearly a century of bull markets but what caught my eye was the nature of the eight bear markets. If you’re an investor then it’s important to realize that it is perfectly normal that you’ll get crushed once a decade. Knowing that it’s normal won’t make it hurt less, but it might make you realize that your pain is temporary. Personally, my worst bear market was 2008. It was a doozy. I share this story to help you remember that THE world isn’t ending when YOUR world collapses. Setbacks are part of life and my making it 20 years without a major financial setback was abnormal. In fact, I had several setbacks along the way (15% hits) that I’d forgotten. Save the chart for a rainy day and I’ll retweet at the next recession. This entry was posted in Uncategorized and tagged antifragile, behavioral psychology, business, decision making, family finances, finance and investing, financial education by Gordo Byrn. Bookmark the permalink.